This period was a little quieter than I was expecting but I still made a decent amount of cash. I’m off to a hot start this week, so perhaps the Christmas super rush is just beginning. I’m pretty confident that I’ll reach my goal regardless. I have an ace in my sleeve: a batch of scrap gold and silver that I can cash in at any time. It’s not the biggest collection, but I’ll definitely trade it in if I’m just short of the mark. I last sold my scrap in July. Also, just a reminder that I’ll be selling my wares at The Plant Holiday Art Market tomorrow from 12-6pm. There will be 24 other vendors, all selling locally made arts and crafts. There will also be coffee, tea, and snacks. It will take place at 185 Van Horne in the Mile End. 1. 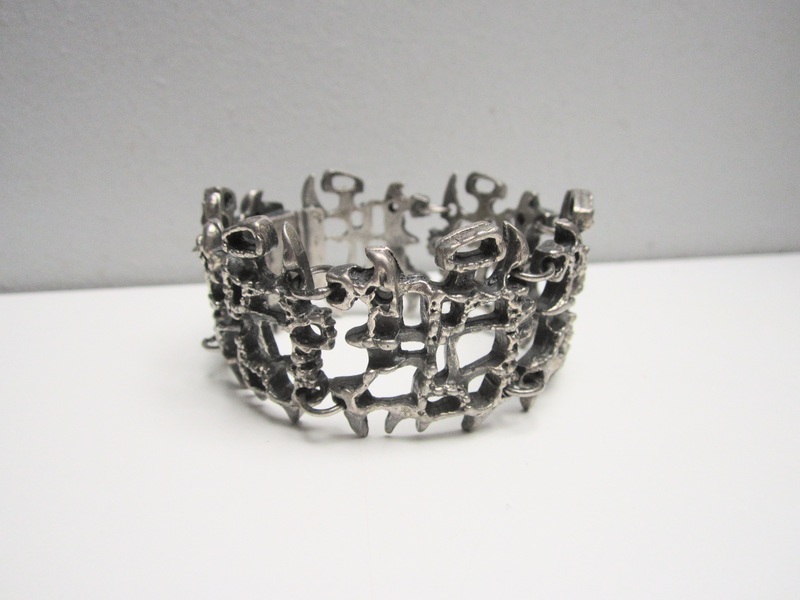 Guy Vidal pewter bracelet: On Etsy for 185$. Part of a treasure trove of modernist and brutalist jewelry I found in NDG back in March. A reader helped me identify three pieces – this bracelet, and two pairs of earrings – as being made by Vidal, making them fairly valuable. All three are now sold, netting me nearly 400$. (To clarify for anyone new: these prices account for shipping expenses, but not eBay and Paypal fees which amount to around 10%). 2. 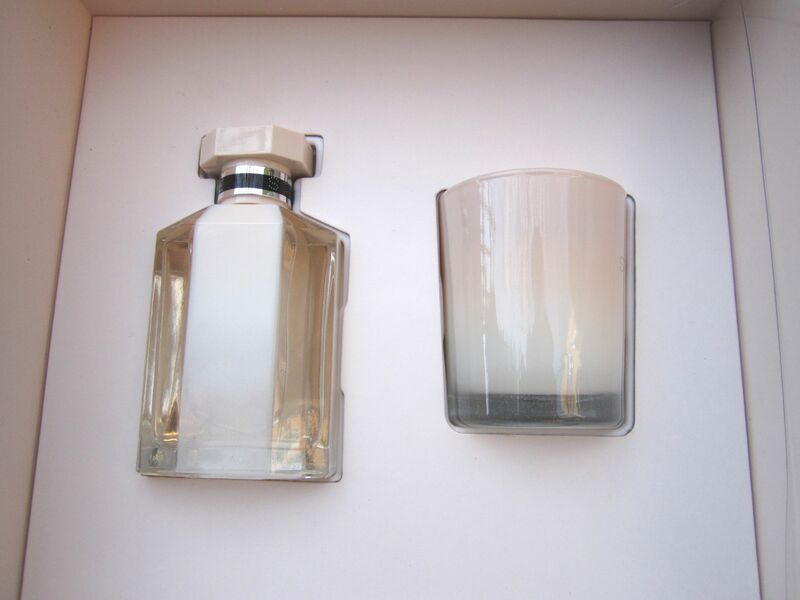 Stella McCartney perfume and candle set: On eBay for 55$. I think this is the first Villeray find to ever make a sales summary. Found about a month ago. 3. 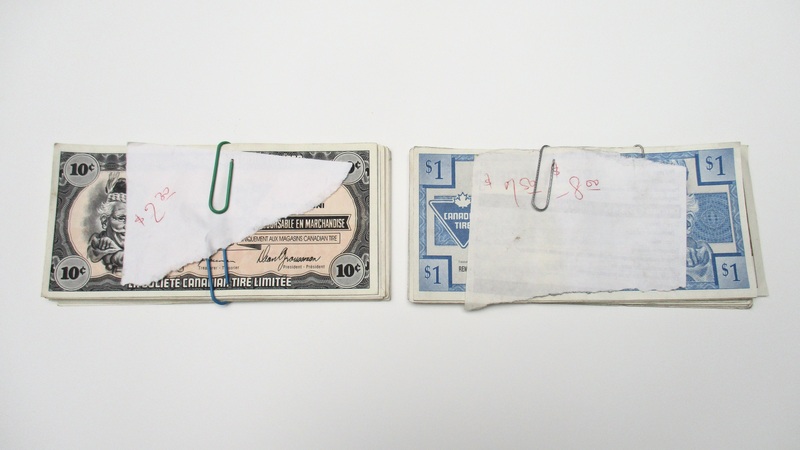 Canadian Tire money: Redeemed for 10.25$. Not really a sale per se (I won’t add it to my tally) but I did use this to get a discount on new windshield wipers. Found in TMR back in October. 4. 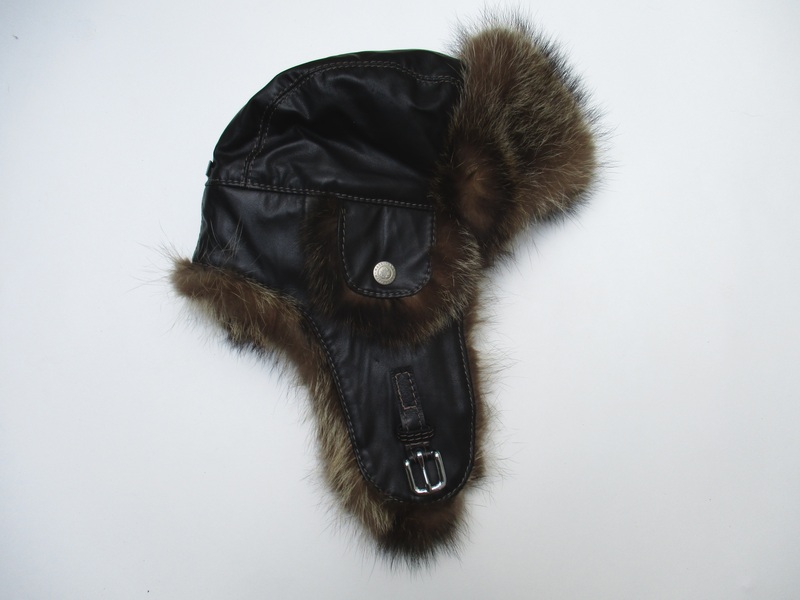 Harricana by Mariouche recycled fur aviator hat: On eBay for 105$. I figured this would sell once it got colder. It was in great shape, like it was never worn. Found late July in Mount Royal. 5. 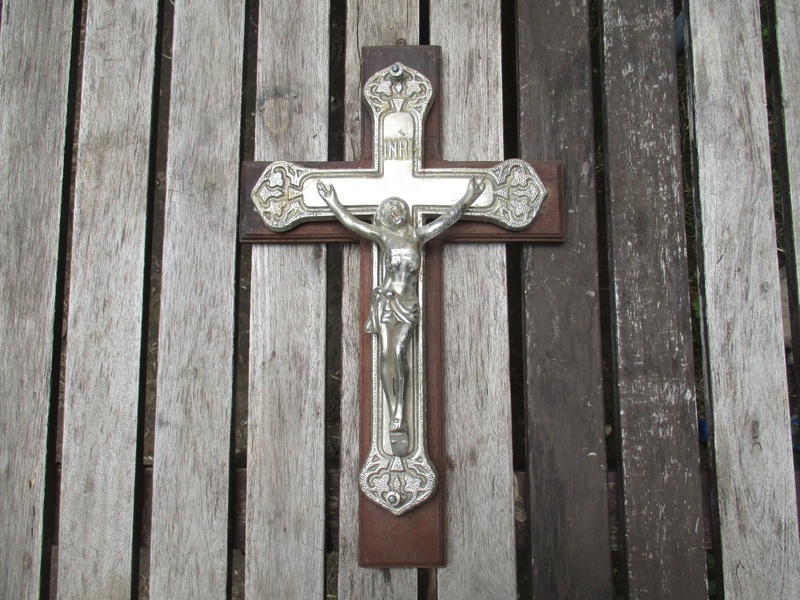 Crucifix and other Catholic pieces: To a reader for 15$. I underestimated the shipping on this, but I still made a bit of cash. Included a St Christopher medallion and a St Famille wall hanging. Found late August in Lachine. 6. Apple remote: On eBay for 12$. Found in a bag of electronic bric-a-brac late July in TMR. 7. Laptop adapter: On eBay for 23$. Not at all exciting, but it made me some money. From the same spot as the remote. 8. 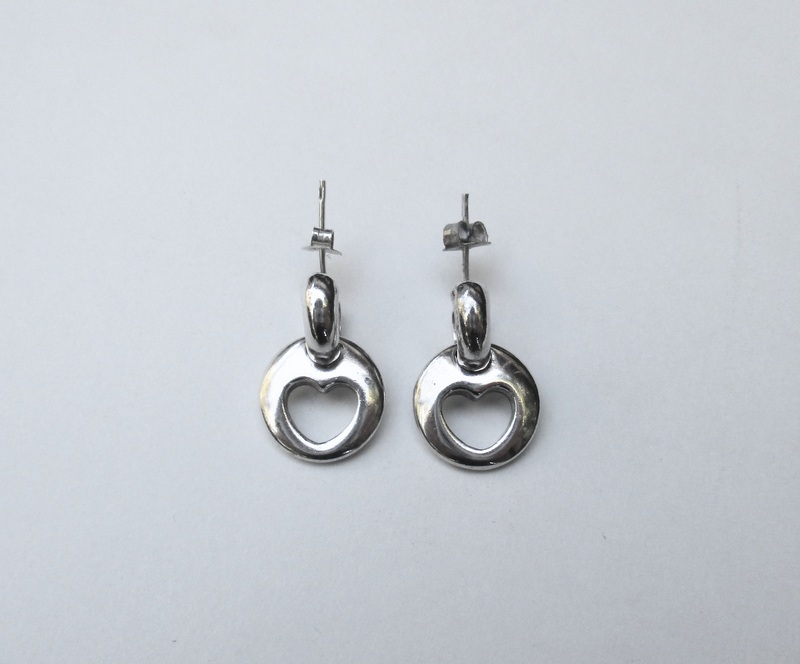 Sterling silver earrings by Tiffany: On eBay for 102$. Found in front of a massive house in Westmount back in May. That spot was one of my most profitable of the year. 9. 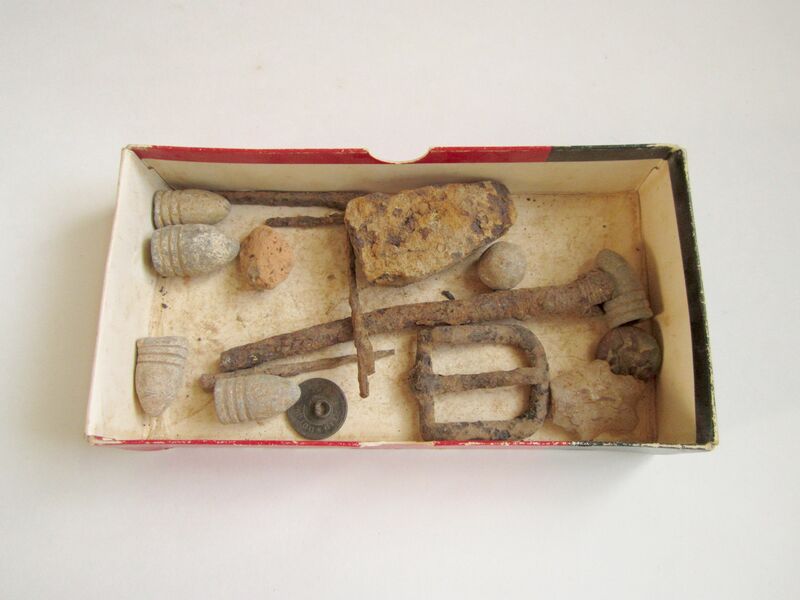 Dug American civil war items: On eBay for 30$. These came from Fredrickburg, if the writing on the box is accurate. I think this is the only item from Pierrefonds that’s ever made this section (it’s too far to go to regularly). Found January 2015. 10. 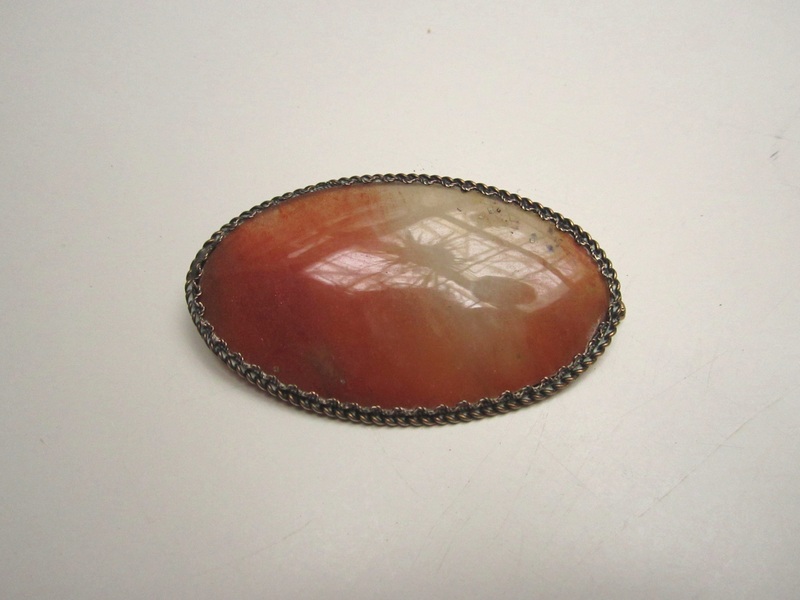 916 silver brooch: To a reader for 20$. Found late April in the Plateau. 11. 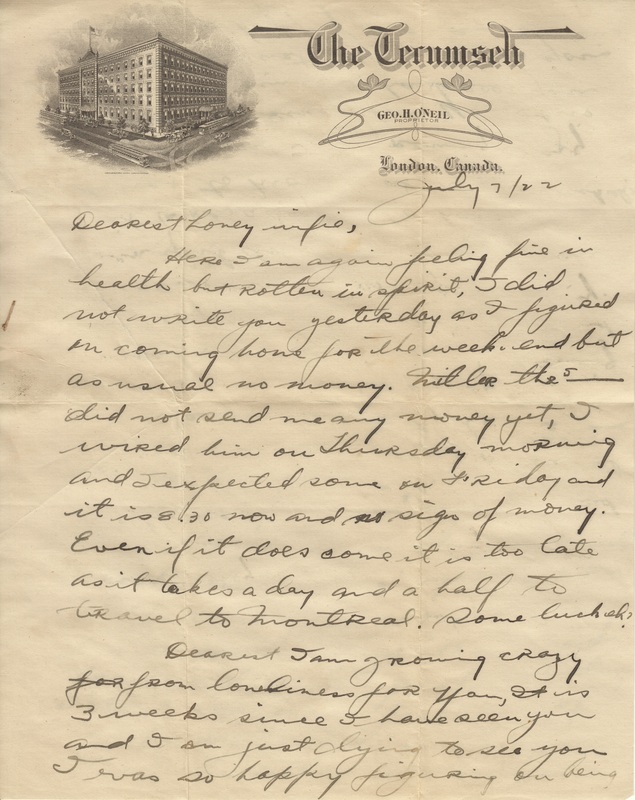 Collection of letters from the 1920s: On eBay for 22$. I underestimated the shipping a bit but I still made money. I’m mostly glad they’ve left the house. Found this summer in Hampstead. 12. Kodak slide projector: On Kijiji for 50$. Found around a month ago in TMR. 13. 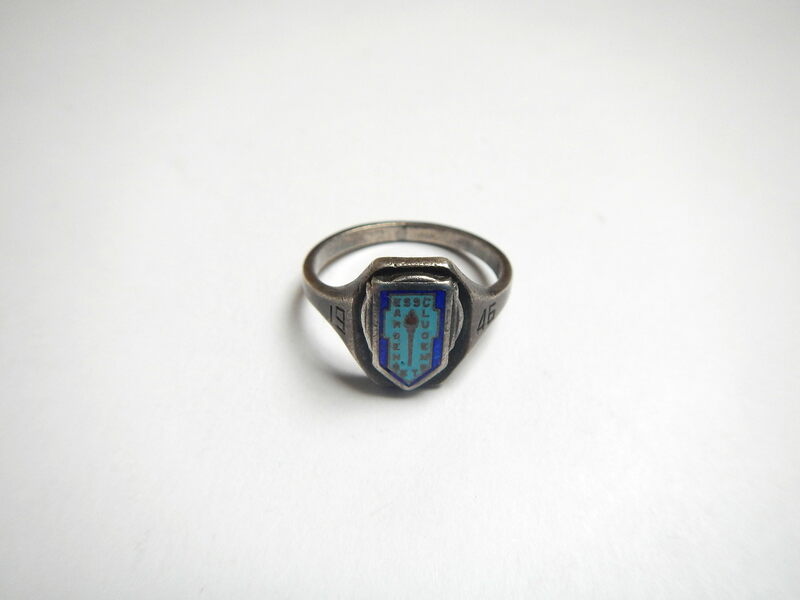 1946 University of Sudbury school ring: On Etsy for 30$. Found April 2014 in the Plateau. 14. 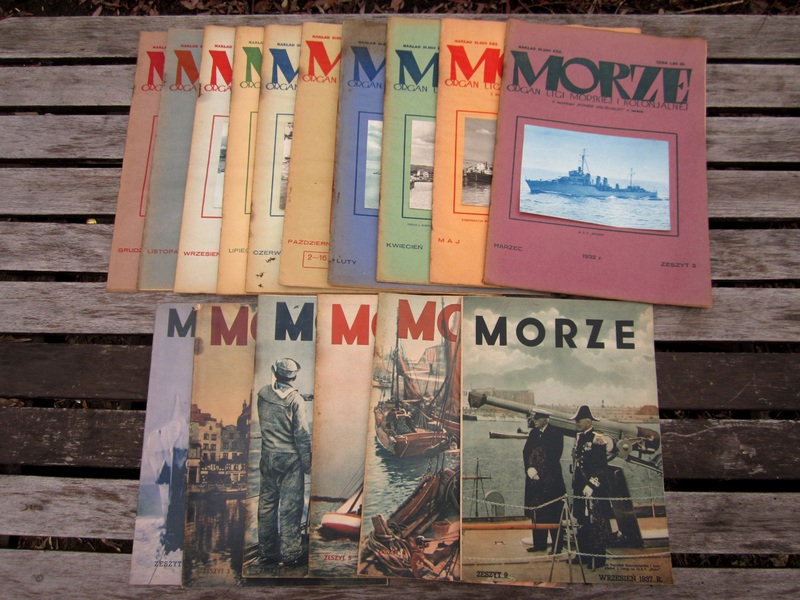 1930s Morze (Polish, meaning “the sea) magazines: On eBay for 80$. This was maybe my favourite sale of this period. I found these magazines in a Cote-des-Neiges dumpster back in May. They’ve been sitting around since then, waiting for me to figure out what to do with them. I finally got around to listing them on Sunday and they sold within 15 minutes. When things sell that quickly (actually, I’m not sure anything has ever sold that quickly before) I often wonder if I could have charged more. However, I’m happy with the price I got. I’m also happy that they’re going to a good home, and that they’re out of mine. But perhaps most of all, I’m happy I’m finally dealing with stuff from six months ago. That means that I’m approaching something resembling an organized life. Total: 729$, 18780.25$ since the new year began. Just a little over 1k to go! I’m very happy to see that collection of letters has found a home. You’re getting so close! Good Luck!!! I agree. I love reading your blog and seeing the amazing array of objects you have saved from dumpsters/landfills/incineration. Bravo!!! I hate seeing “good stuff” go in the trash. You are an inspiration!!! Hi was looking at your eBay stuff. Headline for “dreamstage” says “dreamscape” … Not sure it would make a difference, but if someone was looking for dreamstage it might. Just FYI. Thanks, for some reason every time I see this I want to read “Dreamscape”! Not sure if it will make a difference but it might.